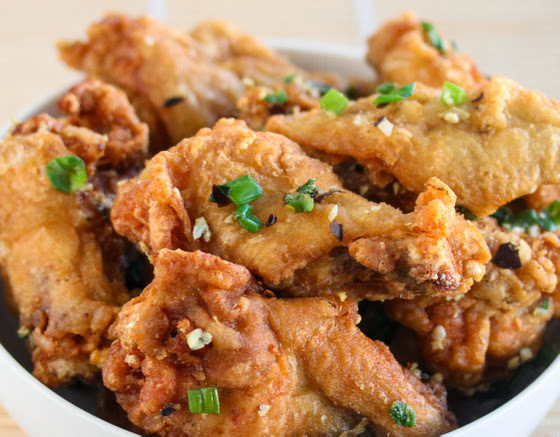 Salt and Pepper Chicken: Succulent chicken pieces dusted with flour, deep fried and seasoned with salt and pepper. A simple chicken recipe made with simple ingredients. Heat sufficient olive oil in a deep pan. Mix refined flour, 1 tbsp cornflour, salt, 1 tbsp crushed black peppercorns and egg in a bowl. Gently slide in the chicken into hot oil. Deep fry till completely cooked. Heat 1 tsp olive oil in a non stick pan. Saute for a couple of minutes. Add sliced onions and garlic. Saute till the onions are golden. Mix the remaining cornflour with 1/4 cup chicken stock. Add the chicken to the spring onions in the pan. Add salt, remaining crushed peppercorns. Add 2-3 tbsps of the cornflour water. Roughly chop spring onions and add. Transfer the chicken into a serving plate. Salt and Pepper Chicken is ready to be served. If you have any queries about this Salt and Pepper Chicken Recipe , please write down in comment box below.